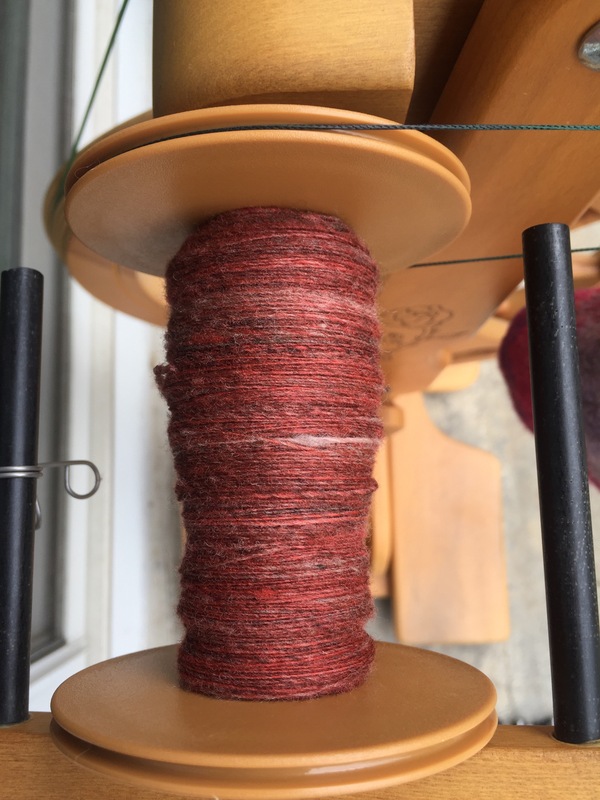 After the last skein of handspun 3 ply from my own stash of fleece processed into batts, I decided to keep going with what I had in stash. I’ve got 3 batts of a rusty red, and one batt of a rusty red with a little bit of leftover green in it. Bad color choice, I know. I am not sure what I was thinking. But, I decided the best thing would be to make a 4 ply, 3 plies of the rust and 1 ply of the combo, in hopes to tone the “off” batt down a bit. Otherwise I fear I wouldn’t bother to spin it at all. The first bobbin of rust is now done, and I am trying to decide if I should do the ugly green and red next to get it out of the way.